Steve Friedman knew his daughter liked to sing and that she was usually louder than most other kids her age when it came to belting out those tunes. What he didn’t know was whether fatherly pride or real talent was informing his opinions of his daughter’s hobby. When she tried out for a part in Sugden Theater’s production of Annie, he realized it was the latter. Chloe Friedman, then just 8 years old, got the lead role. “At that point on, there would have been no turning back,” Friedman said. Seventeen years later, Chloe Friedman is a regular act at bars and restaurants throughout Collier and Lee counties having turned her childhood love of musical theater into singing and songwriting. On Friday, the 25-year-old Naples native will release her third album titled “Homegrown” during an event at Momentum Brewhouse in Bonita Springs. The namesake track on the album talks about Chloe Friedman’s love of her beach-side home town with a shout-out to the 13th Avenue beach downtown. 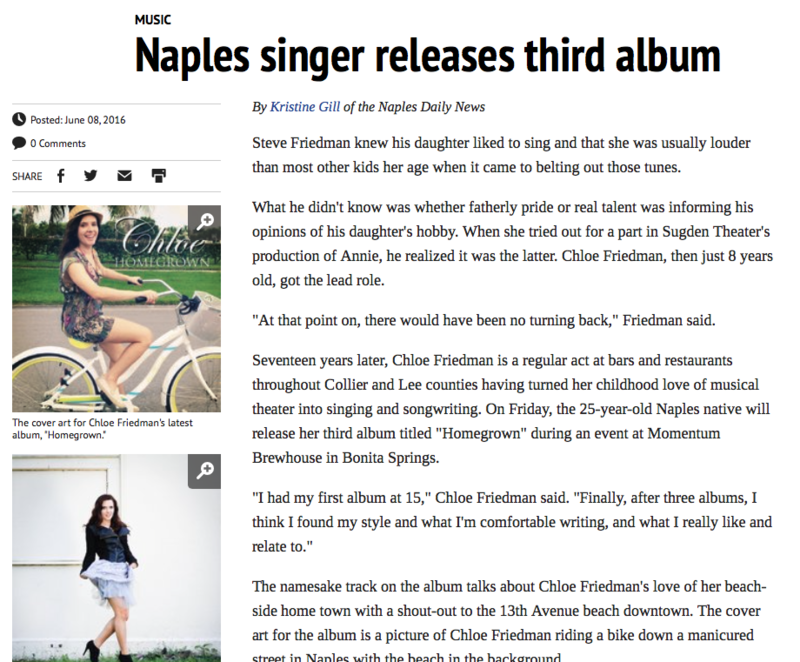 The cover art for the album is a picture of Chloe Friedman riding a bike down a manicured street in Naples with the beach in the background. “I think anyone can relate to loving where you’re from, she said. In the title track, she sings about “a salty nose and sandy toes every day” growing up here in Naples. While Chloe Friedman describes her genre as pop/country, her father said this third album marks a definite move toward a more country vibe. Chloe Friedman said country is her favorite genre to listen to. She loves female artists such as Miranda Lambert. When she finished writing and recording her tracks with her dad, Chloe Friedman had her album sent off to Nashville where it was mastered. This album is lighthearted, Chloe Friedman said. There are no depressing tracts, no heartbreak. “It’s just fun to listen to,” she said. Friedman has been playing alongside his daughter on guitar or bass, both electric and acoustic, at least once a week for the past few years. She performs about 100 shows a year, she said, everything from restaurants and bars to private parties and events. She had her first paid gig at age 13 and used money from singing to pay her bills throughout college at Florida Gulf Coast University, where she majored in communication and public relations. She uses that degree during her day job, but has also benefitted from knowing how to market her own work and get her name out there. Friday’s event goes from 6 p.m. to 9 p.m. Admission is free and Chloe Friedman will be performing while regular patrons eat and drink. Her CD will be available for sale for $10. All six tracks will also be available on iTunes for purchase. She’ll be performing Friday alongside her dad and perhaps her first fan. The guy who introduced her to The Beatles and the guy she taught to love the Backstreet Boys. He’s usually among the first to hear her ideas for a song and the one setting up the acoustics equipment while she readies for a show.